What are Baby Bees Called? The “Birds and the Bees” — of Baby Bees! The scientific name for baby bees is “larvae” (though it may be tempting to call it a “ba-bee” Get it? ☺). Collectively, all of the baby bees are the brood. So, how does the brood get its start? That depends on the type of bee: worker, drone, or queen? An egg that will become a queen bee will go from egg to a queen in 16 days. The potential queen is fed nothing but royal jelly, which allows her to develop fully, allowing her to reproduce. If the queen desires to produce drone bees, she lays an unfertilized egg —which becomes a drone bee in 24 days. For everyday worker bees, they set a fertilized egg vertically at the bottom of the cell. They feed worker and drone bees the royal jelly only for the first 3 days after the egg hatches. After that, they get bee bread, a honey and pollen mixture. This stunts the growth of the worker bee so that she can’t reproduce. (Fun fact: all worker bees are female.) After three days, the egg falls horizontally and hatches into a larva. Abundantly fed by the nurse bees, a larva receives 1,300 visits per day, until the bees close the cell with a wax cover. After eight days, the larvae, swollen with food, become pupae and their organs form fully. Twelve days after the closing of the cell, a young bee is born. During the whole process, the brood remains at a constant temperature of 95 degrees Fahrenheit. See this time lapse video of full honey bee development. Just after it emerges from the cell, a new adult bee eats honey for its first meal. At this point, the honey bee — whether it be a queen, worker or drone — is ready to get to work. For growth, its main food will be pollen mixed with honey (bee bread): an indispensable protein for the first days of its life that helps complete its internal organ development. 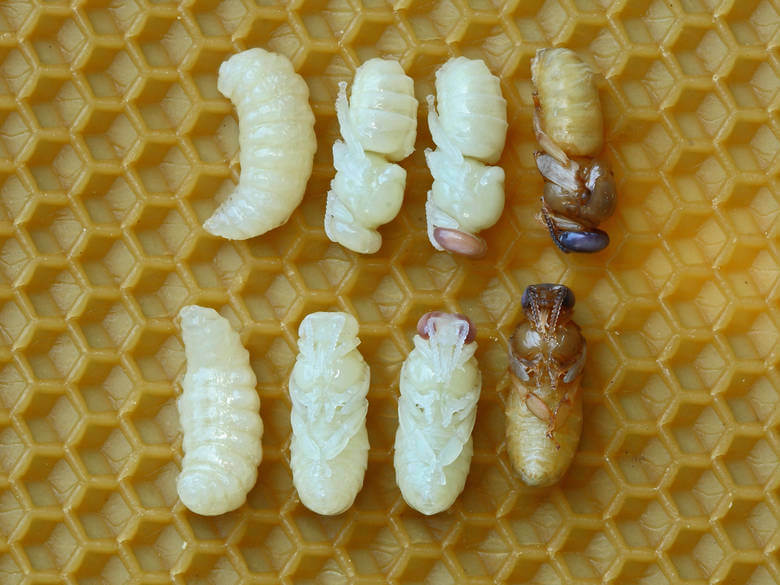 For the four days following its birth, the adult bee cleans the cells for the new eggs the queen will lay. Near the sixth day, it becomes a nurse bee, producing royal jelly, and maintaining the brood at a constant temperature by visiting the cells to feed the larvae inside. Does Honey Help Control Acne?